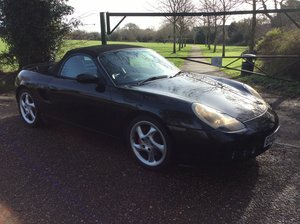 FOR sale here is my 2003 986 Porsche Boxster S manual, 60,250 miles, metallic green over grey leather, 3 previous owners and in really lovely condition. IMS bearing, direct oil feed to IMS bearing and clutch replaced by JZMantech Porsche specialists on 25 September 2015 at 47,311 miles with receipts to prove. All preventative measures. 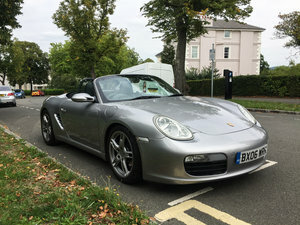 The following options were fitted from factory (in the order of the build sheet): - Metallic paint (green) - Gear lever, hand brake, trim strip, instrument surround and door finishers in burr walnut - Extended grey leather interior including ignition surround, dash top, door panels, air vents, side defrosters - Three spoke sports steering wheel - Porsche Stability Management - Wind deflector - Litronic headlights - On board computer - PCM2 including navigation (last updated March 2016) - BOSE sound system, including speaker between the seats - Switchable Porsche sports exhaust - Stainless steel tail pipes - Short shift gear change - Door entry guards in stainless steel - Coloured wheel centres - Upgraded sports seats with embossed head restraints - Floor mats - Rear park assist - 18" SportDesign wheels Total cost when new £50,533.67. Full service history as follows: Minor - 12,814 miles - Porsche Centre Bournemouth Major - 22,665 miles - Porsche Centre Bournemouth Minor - 34,146 miles - Porsche Centre Bournemouth Major - 38,646 miles - Porsche Centre Bournemouth Annual - 39,746 miles - Porsche Centre Bournemouth Minor - 40,653 miles - Porsche Centre Bournemouth Major - 41,259 miles - Porsche Centre Bournemouth Minor - 43,398 miles - AGM Vehicle Services Minor - 53,341 miles - Porsche Centre Brooklands Major - 57,902 miles - RPM Technik. I had this carried out as a full, 96,000 mile service, which is the most detailed, to make sure that everything was in order. Additional work carried out at the same time included replacing o-ring in joint of L/P a/c pipe and re-gas (now working as it should) and replacement broken offside roof cable. A rev range reading (911Virgin.com have a good guide to rev range readings to help interpret this) of the ECU on 16 March 2019 confirmed the following: - Number of ignitions range 1 - 1,154 /1,771h - Number of ignitions range 2 - 0/0h - Engine operating hours counter - 1,771.6 The car was sold to me with the most amazing history file, clearly showing that it has been well cared for. As well as receipts, it contains a table of works carried out since the car was new including date, mileage, item and garage which I have kept up-to-date, as well as technical specifications, exploded build diagrams for various systems, contemporary reviews and buying guides for the 986. It is remarkable. This care shows in the car. The paintwork is in excellent condition with no obvious defects, the lights are clear without any yellowing at all, it is still on its original windscreen and the alloy wheels are all unmarked (with Michelin Pilot Sport tyres all round with 5/6mm of tread). The front boot contains an unused space saver spare wheel and took kit, locking wheel nut is also present. The rear spoiler works and deploys as it should. The interior is wearing its age extremely well. The upgraded sports seats are great and certainly a step up over the standard items and have unmarked bolsters on both sides. The electric hood operates as it should, including the drops on both windows (going up and down), and is in excellent condition with a clear glass rear screen. No tears or leaks. The sports exhaust sounds amazing, everywhere. Since I have owned the car it has been garaged and kept on a trickle charger, with very limited exposure to rain or other wintery conditions. Will be sold with an OEM Tequipment indoor car cover. Sold with two working fob keys. Private plate to stay with the car. 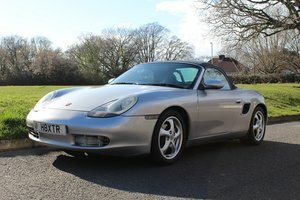 I would consider this to be an excellent example of the 986 Boxster S, with the usual weak points addressed and a remarkably detailed service history, ready to make someone very happy this coming summer. We have recently moved house and just don't have the space to keep it in its current condition (the only rented garage we can find has no power and no door). We have had it in my parents garage since we moved but that was only ever a temporary arrangement, and now it is time to find a new owner who will continue to care for it. Happy to allow test drives with evidence of valid insurance. Any inspection also welcome. Thanks for looking.